On 29 January 1940, the Air Corps issued a request for proposals for a much larger bomber, which was to have the range for operation over the Pacific; this bomber would serve in the inevitable war with Japan. Four firms submitted design studies: the Boeing XB-29, Lockheed XB-30, Douglas XB-31, and Consolidated XB-32. Douglas and Lockheed soon withdrew, in part because Boeing was well ahead of them in the design process. On 6 September 1940 contracts were awarded to Boeing and Consolidated (later Convair) for the construction and development of two (later three) prototypes of their respective designs. Convair's XB-32 Dominator was the first to fly, on 7 September 1942, but extensive development delayed its entry into service. The USAAC's specification had called for a speed of 644km/h, so the XB-29 had a high aspect ratio cantilever monoplane wing mid-set on the circular-section fuselage. Because such a wing would entail a high landing speed, the wide-span trailing-edge flaps were of the Fowler type which effectively increased wing area by almost 20%, thus allowing a landing to be made at lower speed. Electrically retractable tricycle landing gear was provided and, as originally proposed by Boeing, pressurised accommodation was included for the flight crew. In addition, a second pressurised compartment just aft of the wing gave accommodation to crew members who, in the third XB-29 and production aircraft, sighted defensive gun turrets from adjacent blister windows. The crew and aft compartments were connected by a crawl-tunnel which passed over the fore and aft bomb bays. The tail gunner was accommodated in a third pressurised compartment, but this was isolated from the other crew positions. Rather than the traditional bulky manned gun turrets, Boeing used small, remote-control units 'networked' together with an analog computer that compensated for factors such as air temperature and bullet drop. This system was very difficult to develop, but it proved effective. Each gun was served by a 1,000 round bullet belt. The powerplant consisted of four Wright R-3350 Cyclone twin-row radial engines, each with two General Electric turbochargers mounted one in each side of the engine nacelle. Prototype production was followed by 14 YB-29 service test aircraft, the first of these flying on 26 June 1943. Deliveries of YB-29s began almost immediately to the 58th Very Heavy Bombardment Wing (VHBW), a unit which had been established on 1 June in advance of the first flight. B-29 production was the most diverse aircraft manufacturing project undertaken in the USA during World War II, with literally thousands of sub-contractors supplying components or assemblies to the four main production plants: Boeing at Renton and Wichita; Bell at Marietta, Georgia; and Martin at Omaha, Nebraska. Because of its highly advanced design, challenging requirements, and immense pressure for production, development was deeply troubled. The first prototype crashed during testing, killing the entire crew and several ground personnel. 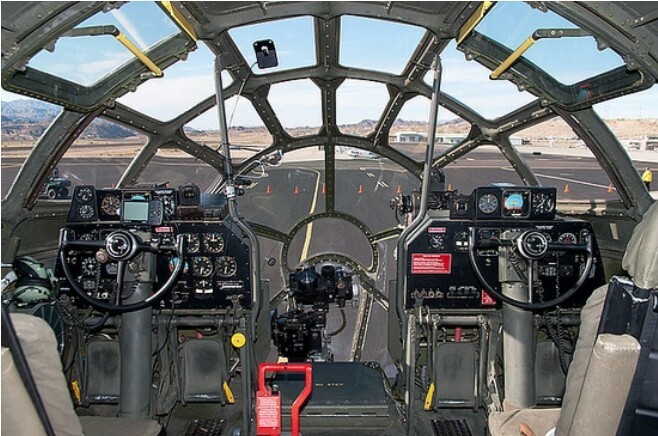 Changes to the production craft came so often and so fast that in early 1944, B-29s would leave the production lines and fly directly to modification depots for extensive rebuilds to incorporate the latest changes. This 'battle of Kansas' nearly sank the program, which was only saved by General Hap Arnold's direct intervention. It would still be nearly a year before the aircraft was operated with any sort of reliability. These weaknesses combined to make an engine that would overheat regularly when carrying combat loads; it frequently swallowed its own valves. The resulting engine fires were exacerbated by a crankcase designed mostly of magnesium alloy. The heat was often so intense the main spar burned through in seconds, resulting in catastrophic failure of the wing. This problem would not be fully cured until the aircraft was re-engined with the more powerful Pratt & Whitney R-4360 'Wasp Major' in the B-29D/B-50 program, which arrived too late for World War II. Pilots, including the present-day pilots of the Commemorative Air Force's Fifi, describe flight after takeoff as being an urgent struggle for airspeed. Radial engines need that airflow to keep cool, and failure to get up to speed as soon as possible could result in an engine failure and risk of fire. B-29 production totalled 1,644 from Boeing's Wichita plant, with 668 built by Bell and 536 by Martin. 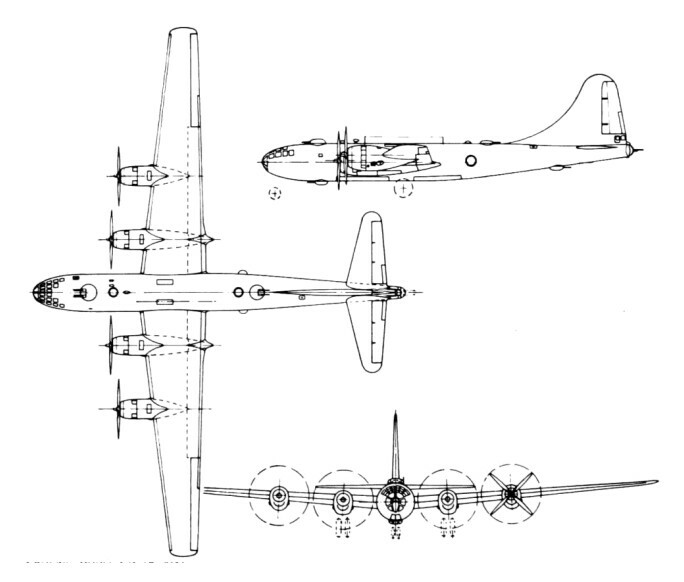 The Renton plant produced only the B-29A variant, with a 12in wider span, later marks of the 2,200hp Wright R-3350 engines, changes in fuel capacity, and the addition of a four gun forward dorsal turret and armament: production continued until May 1946 and totalled 1,122 aircraft. The designation B-29B related to 311 of the aircraft built by Bell. These were reduced in weight by removal of all defensive armament except for the tail guns, which were then unmanned, being aimed and fired automatically by an AN/APG-15B radar fire-control system. The production total of 3970 B-29s of all versions saw a wide variety of employment in the post-war years, operating under several designations. A number of B-29s were used operationally during the Korean War. B-29s were followed by several hundred of many versions of the B-50, with more powerful engines and other changes. These saw action only as tankers in the Vietnam War, but B-29s operated throughout the Korean War, the 22nd and 92nd Bomb Groups open-ing strategic missions as early as 13 July 1950. Though never more than 99 B-29s were on strength, the two groups flew 21,000 sorties and dropped 167,100 tons, more than the tonnage dropped by B-29s in World War II. B-29s force-landed in Soviet territory were dissected in minute detail, and the Tupolev design bureau built first a simple transport, the Tu-70, followed in July 1947 by the first Tu-4 bomber. This was a B-29 except in having 23-mm cannon in its five twin turrets. About 400 were built, but they did not see action; their main importance was that they were the starting point for all to-day's Tupolev strategic turboprop and jet bombers. Some of these remained in service into the 1960s in the Soviet Union. All but one of the Tu-4s were scrapped in the 1960s. The lone example of a Tu-4 known to exist today is located at the Yuri Gagarin Air Force Academy near Moscow, as a static display. This particular airplane was tasked with bombing the Budapest headquarters of the Hungarian rebel movement during the 1956 rebellion; but although the mission was rehearsed it was never put into play. The KB-29 was the tanker version of the B-29, the SB-29 the search & rescue version, carrying a lifeboat; the DB-29 was a drone controller, the TB-29 a trainer, the RB-29 a reconnaissance aircraft. Some B-29s were also used as launch aircraft for research aircraft like the X-1 and X-2. The KB-29P flying boom flight refuelling tanker version and the SB-29 search and rescue aircraft were still in service in 1955. The SB-29 equipped to carry an A.3 remote control lifeboat under its fuselage. 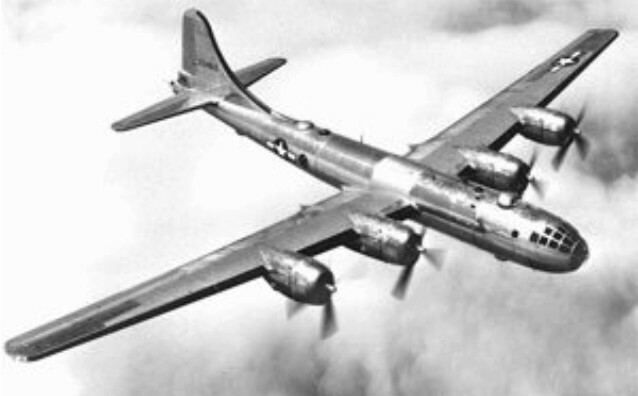 Eventually 4221 B-29 were built. The USAAF's 58th Heavy Bombardment Wing was established. This wing was equipped with Boeing B-29 superfortresses for strategic attack on Japan. 47 B-29s bombed the imperial iron and steel works at Yawata Japan. A new non-stop distance record of 7,916 miles was set by B-29 bomber "Pacusan Dreamboat" after flying from the island of Guam to Washington DC. The last B-29 in front-line service, based at Kadena, was retired. The B-29s were replaced by the B-47. Take-off power: 2,200 hp at 2,600 rpm w/ manifold pressure of 47.5 in. Military power: 2,200 hp at 2,600 rpm w/ manifold pressure of 47.5 in at 25,000 ft. Manufacturer: Hamilton Standard Propeller division of United Aircraft Corp. Diameter: 16 ft. 7 in. Span: 141 ft. 2.76 in. Maximum fuselage diameter: 9 ft. 6 in. 1. Inboard engines: 9 ft. 5.6 in. 2. Outboard engines: 10 ft. 8 in. Ground clearance of inboard propeller tips (taxi position): 14.1 in. Chord tip (70 feet 10 inches from centerline of fuselage): 7 ft. 5 in. Maximum chord: 11 ft. 2.4 in. Wing (less ailerons): 1609.68 sq. ft.
Wing (flaps extended, plus ailerons): 2070.88 sq. ft.
Alierons (total, including tabs): 129.2 sq. ft.
Flaps (total): 332 sq. ft.
Stabilizer and elevators (including tabs): 333 sq. ft. Elevators (total including tabs): 115 sq. ft. Elevator trim tabs (total): 10.12 sq. ft.
Vertical fin: 131.9 sq. ft.
Dorsal fin: 40.6 sq. ft. Rudder (including tab): 65.5 sq. ft. Rudder trim tab: 5.79 sq. ft.
Armament: 10 or 12 .50-cal. machine guns and one 20mm cannon plus 20,000 lbs. of bombs. Maximum speed: 357 mph at 25,000 ft. Engines: 4 x four 2,200-hp (1641-kW) Wright R-3350-57 (or related) Duplex Cyclone 18-cylinder radials. Wing span: 43.05 m (141 ft 3 in). Length: 30.18 m (99 ft 0 in). Height: 9.02 m (29 ft 7 in). Wing area: 161.28 sq.m (1,736.0 sq ft). Weight empty: 31816 kg (70,140 lb). MTOW: 64002 kg (141,100 lb). Maximum speed: 576 km/h (358 mph) at high altitudes. Service ceiling: 9750 m (32,000 ft). Range with maximum bombload: 5230 km (3,250 miles). Armament: bombload of 9072 kg (20, 000 lb), plus 10 12.7-mm (0,5-in) machine-guns and one 20-mm cannon in five turrets. Armament: bombload of 9072 kg (20, 000 lb), plus 10 12.7-mm (0, 5-in) machine-guns and one 20-mm cannon in five turrets.